Taking your pictures from new heights! This site was designed to be a simple photo gallery to display the quality of our work. However, if you would like to purchase one or more of our photos, please let us know using the Contact Us form. Welcome to Aerial Photos of Maine where we are Taking Your Photos From New Heights. We are a small company in beautiful Central Maine offering aerial photography of Maine towns, businesses, homes, real estate and events. If you are looking for a high resolution birds eye view of your property or event, you've come to the right place. Our rates are reasonable and satisfaction is guaranteed. To try and keep costs down for you, we schedule different areas to photograph each week. If we can combine several photo requests into one flight, then it saves money and time for everyone. We then pass that savings on to you. If you are interested in having us take photos for you in the near future, please let us know by filling out this short form. The background image is Oakland, Maine. To see this photo better, please visit Oakland's Album. All pages copyright © All rights reserved. is part of the Hometown USA ® network of websites. 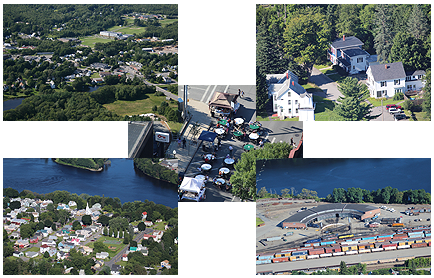 Aerial Photos Of Maine is a division of A2Z Computing Services.